Love taking your cat out but ​​don’t like the single ​strap carriers? Who can blame you? With every step you take it bangs against your side and digs into your shoulder. This is the ​why backpack cat carriers were created. ​They are really versatile and ​far easier on us humans. 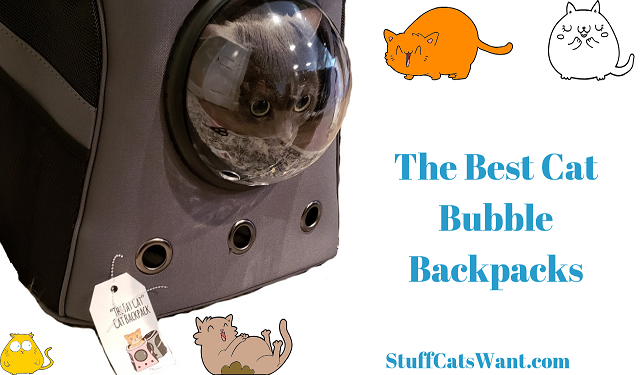 ​My favorite backpacks have a bubble built right in​ to provide a ​view for your cat and ​them look like an astronaut! ​Every cat owner ​should have one! ​It ​will get ​you and your cat out ​more than any other method! Let’s take a look at the best cat bubble backpacks. Texsens is ​the most well known brand of bubble backpacks on the market today and probably the most trusted as well. They’ve they been one of the pioneers in developing this type of carrier so that’s no surprise. ​Texsens ​has been producing high quality backpacks for both cats and dogs now for several years. This gives them an edge ​because they have a bunch of experience and feedback to build their products off of. ​You can open top or either side making it easy to get your cat inside. ​You can also check out my full video review below or read the full written review by clicking the button below. The Fat Cat is an excellent bag specifically designed for larger cats. It is difficult to tell from the picture, but it actually has quite a bit of extra space inside it compared to other cat backpacks. The company that designed it has said it is rated to hold cats up to 19 pounds, that's quite a hefty cat to stick inside a backpack, but I honestly believe they'd fit given my experience! There are a couple of mesh pockets built into the side to easily carry treats etc. Petforu comes to the market with what is ​one of the nicest looking and most versatile faux leather cat backpacks on the market. ​It of course still comes with the amazing astronaut ​bubble window to let your cat get a great view out. ​This model has a ​ton of ventilation slots built into it so your feline friend stays ​has plenty of fresh air to breathe, but it also ensures that it stays nice and cool inside the backpack even if it is a little toasty outside! You’ll notice an obvious difference in the design of this bag right away, it isn’t your typical two shoulder strap backpack! ​If you want to be extra trendy with a capsule bag and ​give your cat ​plenty of space to lay down you can go for this messenger style bag. ​While this is a really cool and trendy looking bag, do be sure you do some measuring first to ensure your cat will have sufficient room to move around inside of it. That or ensure your cat loves to lay down while bounding along on a walk with you! Also keep in mind since this is a messenger style bag ​it is a single strap ​on your shoulder. Giantex is ​a company that has been at making cat carriers and pet products for quite some time. This ​model is is of course their astronaut’s cat carrier to give your kitty a nice safe view of the outside world while keeping them in a controlled environment. This is a relatively novel idea in the bubble carrier space in that Pettom has essentially designed a carrier that is primarily a backpack, but it can also be attached to an associated roller. This means if you’ve got an extra long distance to travel or perhaps a nice smooth bit of road or sidewalk and you just want a break you can drop the backpack right into the roller and keep going. The dimensions are 12.6″L x 8.7″W x 15.8″H. Add in the wheels the height ​is 36 inches. ​Note: You can buy this model without the wheel attachment and save yourself somewhere in the area of $15. If you don’t feel you need the wheels it is a nice option to have handy. You’ll notice a couple of distinct differences in this carrier right away. First and foremost it is a hard shelled carrier which is far less common. This means that it maintains its space integrity inside much more effectively than canvas or nylon carriers. You’ll notice a distinct difference between this bag and the other versions that Texsens has on the market, primarily in the overall design structure. This backpack is designed with the intent that you’d be loading your cat from the top, there is no way to unzip either of the side compartments and let your cat enter the bag this way. Another variation on the Texsens backpacks above, this one instead moves the bubble to the top of the carrier as opposed to back side of the carrier. While clearly a preference option, this will provide a heck of a lot better view up and out as opposed to toward the back of the carrier. No surprise I suppose! This model is also made of canvas specifically to encourage air flow for your feline friend while you’re out and about on your adventures. Your cat will stay nice and cool while going for a ride in this backpack. ​If you're looking for a something a little bit beyond your typical space capsule backpack you can spring for the Keedo Pet Transparent Carrier. This one has a completely transparent back side so your cat can see everywhere the entire time. There are of course benefits and drawbacks to the exposure. 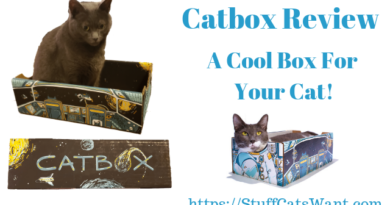 If your cat is super outgoing and loves new things then this is a great option and you'll get tons of compliments on your kitty! Lemonda brings to the market another excellent looking space capsule type carrier with all the bells and whistles that will make you love it. This backpack is designed with extra padding on the straps so you can take your cat for long walks or hikes and it is specifically engineered to allow you to wear it either on the front or the back! Right, it isn’t a backpack. I know, I know! But it is still an excellent carrier and I wanted to include it because of the key unique feature. This carrier is so easy to break down and fold into a really small space. Most of the backpack carriers I have indicated so far don’t really have a way to collapse. This means they take up a lot of space when they aren’t in use. This model can fold down to only a few inches tall. Great for storage! Comfort: The biggest factor I’ve found in making the switch is that bubble carriers are just far easier to get around with than a traditional single strap shoulder carrier. Backpacks were designed for this purpose specifically, and cat backpack carriers are just a heck of a lot easier on your shoulders than that single strap is. Safety: The bulk of backpack carriers come equipped with additional safety features that traditional carriers don’t have included. While this is largely because they are often designed for Adventure Cats it doesn’t mean those safety features are any less helpful for your typical cat just going on walks. Cat Happiness: A lot of traditional carriers don’t provide the best view in the world for your cat. They can of course hear a lot through the mesh, but they often can’t see much through it. This is limiting and makes the trip boring! The space bubble lets your cat see everything going on around them and gives them a chance to check out the world. Style: Let’s be honest, they’re just plain cool looking compared to a typical carrier. And it is way easier for other people to check your feline friend out as you take a walk! What could be better?!?! If you’re still curious about traditional carriers (I still have one myself) then I would also recommend you read my other article here on the best traditional carriers out there. It should help you make a decision if you’re not sold on a backpack yet. When you bring a new carrier home you’re going to want to take some time getting your cat used to the carrier before immediately loading her right into it and taking her for a walk. While I understand you just got this really cool carrier and want to show it off and show your cat off I would suggest a gradual approach to use. This will ensure that you don’t scare your cat away from the carrier right away and then have to spend weeks getting he or she acclimated afterward. While it is not a necessity by any stretch of the word, many people that use bubble backpacks also have a desire to leash and harness train their cat to take it on adventures. This is no surprise, if you want to show your cat the world you’d also want to let them out to actually get a chance to explore it a little bit. Introduce the Harness: As with anything else (costumes, collars, etc.) you’ll want to introduce your cat to a harness slowly to ensure they associate positive things with it. This means letting them sniff it, letting their scent get on it, and of course rewarding them with treats when it is nearby. You can also spray some Feliway on it for an added benefit. Slip It On: Put the harness on your cat, but don’t actually tighten it up. This will let her get a feel for it without restricting her movement. Over time tighten the harness and then remove it after short periods of time working up to longer attempts. Again, treats and praise go a long way. Attaching the Leash: Once you’ve got your kitty used to the harness you can attach the leash to it and take her outside. This is where your let your cat do the exploring. Go at her pace and let her figure out what is of interest. As she gets more used to the world outside then you can start encouraging her to follow you and keep pace with where you want to go. Always pick up your cat and carry them through the threshold of the door when you’re first harness training her. This makes her think that’s the only way to go outside. Otherwise she’s prone to learn the second the door opens she can bolt out. Don’t leave your cat unattended outside, especially with a harness and leash on. This is an easy way for your cat to get stuck and injured. Always ensure any cat that is going outside is microchipped at the least. I also recommend a breakaway collar with tags with your cats essential information. Now if you don’t happen to trust me about how awesome these backpacks are then you should definitely take the word of YouTube star Anna Akana. Here’s an awesome video of her showing what happens when she goes out with her cats in her bubble backpack! My personal opinion is that cat bubble backpacks are a heck of a lot more versatile than your traditional style carrier. First off, they look a heck of a lot better! But they also give your cat a much better view of the outside world while still maintaining all of the important safety features that come with a regular carrier. Another huge benefit is that you’re going to have a heck of a lot more comfort for yourself when you use a backpack style carrier. It is a heck of a lot easier on your shoulders and your back because it distributes the weight a lot more effectively than a single strap. Do you use a backpack carrier for your cat? Does yours have the cool bubble to give your cat a view of the outside world? If I’ve missed any of the awesome bubble backpacks please send me a link. This way I can track down those additional options and get them added to the article. Feel free to leave a comment below or send me an email at Craig@StuffCatsWant.com. These are fabulous. I’ve never seen these capsules before. Just the thing I need when traveling with my mother-in-laws cat. Hahaha, too funny. Is your mother in laws cat anything like the typical mother in law? Hopefully they are both very kind to you! I had never seen or heard about these cat bubble backpacks, and from your article, I can see there great advantages of using it. Not to mention it’s very cute! It’s indeed easier to carry than traditional carriers, plus I like the fact it gives the cat a better worldview. Another important thing that I saw is that there are small holes on the top of the transparent sphere, which helps ventilation when the cat is looking through it. I will definitely get one. I think I will find the best price on Amazon, am I right? For the models I’ve listed in my top 10 here you are definitely correct that the best price you’ll find is on amazon. If you check the big blue buttons you’ll find your way to the cheapest sellers on Amazon! looks like many people have a hard time getting the window in place on all these bags, did you have any issues? Changing out the window for the bag can actually be a pretty difficult job the first time around. The hardest part is removing the existing piece that comes when the bag is shipped to you, as soon as you figure that part out you’re golden. Really the best help I can give is that you’ll find on each of the product websites or product descriptions on Amazon. Take a look at each individual link for the respective directions. I never knew these existed. I but they are a total game changer. These cat back packs are even stylish enough to not be embarrassed about using them. Any cat lover should be on to this. Whats the average price with the cat back packs? They vary in price, if you click each link it’ll take you to the cheapest place to get them. That being said, they run anywhere from about 30 dollars up to about 80 dollars depending on the model you decide to go for. I LOVE THESE! I love how they are better than normal carriers and have the bubble so that the cats get to see the outside as well! They are pretty fun and you certainly get a lot of looks while walking if your cat happens to have his or her head right in the bubble area! OMG! So cute! I know some friends who would love these! It’s funny cause I never knew these were made! Well, they are a little on the rarer side if you live outside the city. I think lots of city cats get a chance to go for rides in the compared to cats that are already more prone to be let outdoors. They are quite the riot though! These are funny. I guess I never thought about getting Jessie something else, beyond the typical carrier. She’s an indoor cat, so it isn’t something that I think about very often. However, this article has a lot of things to think about when it comes to this, and I will look into it. Being able to get them on Amazon makes it easy as well. You’ll certainly get a lot more comments and attention when you take your cat out for a walk in this kind of carrier haha! It is quite comical to say the least. thanks for this very interesting article! I have one question about those kind of bag about the temperatur inside. I’m planning to take my cat on hiking this summer and I want to be sur that my cat doesn’t have to hot in the bag. Generally speaking the bags have great ventilation. Unless you are out for a very long time or in very hot temperatures I wouldn’t worry about it. I use this version in the summer with my cats often and it works great. It has 15 ventilation holes when the bubble window is installed and also has 2 large scale mesh vents on the sides. If you’re out hiking though you can always let your cat out for a little while. The version linked above also has a hook for your leash and harness so your cat is safely connected to the pack. Well, what will they think of next. I liked the ones approved for airline travel and the one with the backpack or pull behind as this is very versatile. Like you said, it is very important to get the cat used to the backpack before trying to use it. The hopefully will reduce any stress of using it. The rolling version is nice if you have a long distance but you might also run into stairs or something like that. Outside that it does end up being a little bit more uncomfortable on your back cause of the framework built in for the wheels and the handle. Wow I never knew these existed! I am going to tell my cousin to check out these alternatives since she is crazy about cats! Great job in scouting out awesome, unique, charming cat products like this! 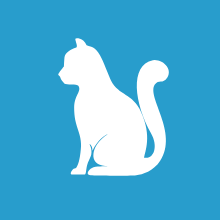 I am sure my cousin as well as other cat lovers will love this website! interesting! never knew these existed. Yeah, who knew right? I feel like I find a new product for cats every week! This would be purrrfect for my mother-in law 🙂 She loves her cat and would absolutely love this product. I’ll send her this link! Great, thanks for passing it along! Her cat will be the star of the show wherever she goes! Hope that she finds it helpful! I know that my cats absolutely love going on walks in the backpack. Beast especially. It is a great conversation starter too :). These are really cool, my girlfriend would love getting something like this for a cat or a small dog, likely a dog since we have one and she’s allergic to cats. Well cats are not much bigger than our dog so maybe we could try it? we have a tiny little yorkie. Do you think that would work? Yes, they will work for small dogs as well. Most of the bags are designed for ‘small animals’ as opposed to a specific animal so you should be in good shape. I’ve even seen people use them for rabbits and they work quite well for them too. What an excellent idea to carry your cat around. This would work well when going to the vet as it is better than the cages in my opinion. I also like that the bag has a lot of ventilation for the cat to breathe. The comfortable and adjustable straps are an extra bonus and because the cat is on your back your hands are free to do other things such as carry your cat’s files. You’re spot on! I use my FatCat and my Texsens backpacks when I take Lexi and Beast to the vet. They like them a lot more than traditional carriers because they are already used to them from the walks I take them on. This not only makes it easier to get them in and out of the carriers, but I also get lots of fun comments and people checking them out through the big bubble window! I really find this article helpful in making the right choice choosing the right cat bubble backpacks. You’re so lucky you have a friend that will watch your kitty for you while you’re away! 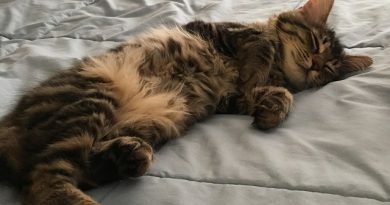 I travel for work constantly as well and it can be a hassle to find someone to keep an eye on the cats without paying a professional cat sitter to do it for you. Carriers are a great option though if you want to show your cat off while you travel. The only thing I’d say is you’ll definitely want to determine if your cat actually likes to travel. Some cats are total adventure cats and love it. Others not so much, they’d rather probably stay at home or stay with your friend. 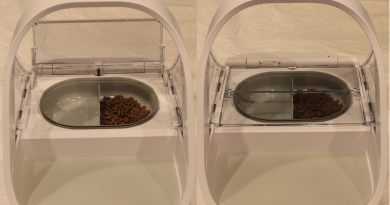 If you travel for short periods of time an automatic feeder might be a good idea. Awesome post! LOVE IT!! While these kinds of backpacks obviously weren’t build with things like camping in mind, I do expect my backpack to meet a certain standard of durability. If I were get a pet backpack, I would want to get one that lasts and is made of quality materials! Specifically, I have been eying the “Fat Cat Backpack for Large Cats”. You, I’ve got a tabby cat, her name is Zoey, and she’s a BIG cat. Of all the pet backpacks you’ve shown, I feel like this one best suits my (and my kitty’s) needs. It holds up to a 19 lb cat, she’s definitely not THAT big, she she’s up there lol probably 13 lbs. The Fat Cat is great. Lexi loves riding around in it. As for camping…I don’t think any were designed to be big enough for a cat to stay in them for hours and hours. But the version from Texsens that is canvas based is specifically designed for hiking purposes. It is extra light and will repel water to a point, so it might be the right fit for someone that wants to go for long hikes but also wants a place for their kitty to relax at the camp site.